Carbondale, IL - HeartlandArts.Net is pleased to announce the winners of the Bleeding Hearts Photos Contest. The winner of the popular vote conducted online was “reaching the cold heart” by Alison Charles of DeSoto, IL. The winner for the vote by the panel of judges was “Apprehended Obscurity” by Aunia Kahn of Shiloh, IL. Special thanks goes out to all the photographers who participated and our panel of judges, as well as everyone who came to see the show and cast a vote online. We congratulate our winners, and all the photographers in the contest for putting on a great show! Bleeding Hearts, the phrase can create different interpretations. I began with the literal meaning of a heart. 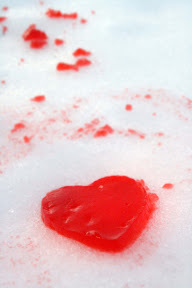 The image "reaching the cold heart” represented the idea of a heart that cares (melts) while everything around it is cold, frozen, and empty. For winning, Ms. Charles will be featured in a solo show at the Red Ear in Alto Pass April 3rd-12th, launching with a First Friday reception April 3rd, with more details to be forthcoming on HeartlandArts.Net. The panel of judges was Chuck Novara, Photo Editor for the Southern, Keith Cotton, Professional Photographer, and Scott Kemmerer, Visiting Assistant Professor at SIU Carbondale’s Department of Cinema and Photography. Judges for the Bleeding Hearts Photo contest met together as a group on Friday February 13, 2009, to view in person the entries for this year's competition. Each judge visited the HeartlandArts.Net website to view all of the entries individually for the next 5 days. On Wednesday February 18, 2009 the judges again met as group and viewed the images at Art Lovers Trading Company and Fusion, in Carbondale. A unanimous decision was reached in choosing Aunia Kahn, "Apprehended Obscurity". I would like to thank everyone for the kind acceptance into the Bleeding Hearts Photo Competition. Thank you for all the votes and support and with this I am honored today to hear that I have been selected as the winning artist. The artwork in this competition was amazing and I was very pleased to share my work in a space with some other great creatives. Again thank you very much, and come join me at my solo exhibition in June! The show will remain online on HeartlandArts.Net, and can be seen in person over the coming week at Art Lovers Trading Company from 11:30am-6pm M-F and by appointment, and at Fusion evenings excluding Monday from 4pm. HeartlandArts.Net has additional shows coming up later this year, including another art contest in October, details to be announced. Artists and art lovers can stay up to date with the latest HeartlandArts.Net happenings by subscribing for the “Art Shows” or “Artist Marketing” newsletter on www.HeartlandArts.Net.